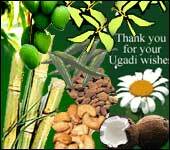 Ugadi (literally - the start of an era) is the new year's day for the people of Andhra Pradesh and Karnataka in India. It is the Chaitra Sudhdha Paadyami or the first day of a lunar year, which generally falls in the months of March or April of the Solar Calendar year. These different tastes in the mixture symbolize the mixed nature of the coming new year.